Concrete sealers are critical when it comes to the beautification and protection of concrete surfaces. The following is a list of guidelines that should be followed when applying membrane forming sealers. All surfaces to be sealed MUST be properly cleaned. Concrete surface must be clean, dry, and free of contaminants, and preferably cool, out of the direct hot sun. Sealers applied to hot concrete in direct sun can bubble, or flash set, creating an uneven appearance. Early morning dew (condensation) can be difficult to see and can prevent proper adhesion of sealers. Avoid excessive variance between concrete temperature and air temperature. For patterned or colored concrete, be sure to wash off any residual powder release that may inhibit adhesion of the sealer. Soaps and detergents should not be used to clean concrete surfaces prior to sealer application. Detergents are emulsions, and if allowed to dry on a surface, they can form a barrier that inhibits the bonding of most acrylic sealers. Sealers may be applied with a pump sprayer or solvent resistant short nap roller. If roller-applied, do not roll too quickly to avoid whipping air bubbles in sealer or use an application pad. If using a sprayer, make sure it is clean and has a fan tip nozzle adequate to apply a uniform membrane. Never let the pressure of the sprayer drop below optimum. Clean sprayer immediately following application with mineral spirits or xylene. Test the sealer in an inconspicuous area for desired appearance and to ensure proper adhesion. Sealer should be applied in a very thin and uniform manner. Back roll any puddles immediately. Over-application will result in a mottled appearance, could trap moisture, and will not allow sealer to cure properly. 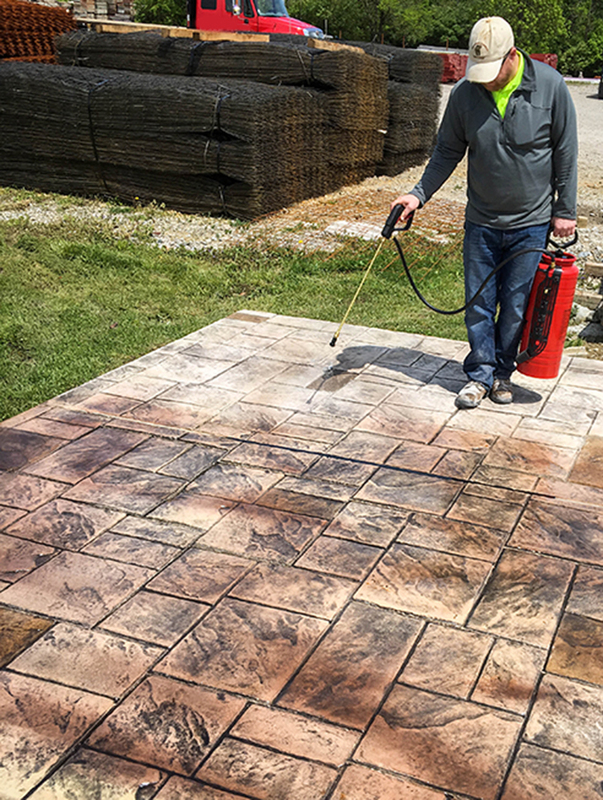 If over-application or excessive puddling occurs, immediately spray mineral spirits or xylene on top of the sealer to keep liquid and brush out excess, allowing the sealer to properly cure. For increased gloss, a second coat may be applied after first coat has thoroughly dried, typically 4-6 hours. Two thin coats will produce a better gloss than one heavy coat. Cross roll to ensure even application. Apply one direction and then cross roll in perpendicular direction. Check out our Signature Sealers – a line of decorative, protective sealers designed to beautify, protect, and rejuvenate stained, stamped, polished, and exposed aggregate concrete surfaces such as driveways, garage floors, patios, walkways, pool decks, and more.